When designing Mountain West Hard Cider’s new patio, owners Jeff and Jennifer Carleton wanted to re-create an outdoor venue reminiscent of an Old World German beer garden. The DABC isn’t trying to block the business, Jeff Carleton insists. There’s just not a state liquor license that seems to fit this spot at 417 N. 400 West in Salt Lake City’s transforming Marmalade neighborhood. (Francisco Kjolseth | The Salt Lake Tribune) Kala Rae pours a drink at The Garten recently. Jeff and Jennifer Carleton, owners of The Garten, a new German-inspired beer garden in Salt Lake City are having a difficult time getting a permanent liquor license from the DABC. They don't qualify for a restaurant liquor license, because the venue doesnÕt have an on-site kitchen. They were denied a reception center license because they need to serve more than just offerings from food trucks. A bar license is an option, but the CarletonÕs would prefer to keep The Garten an all-ages venue, so that parents can bring their minor children. Right now they are operating on special event permits. (Francisco Kjolseth | The Salt Lake Tribune) Jeff and Jennifer Carleton, owners of The Garten, a new German-inspired beer garden in Salt Lake City are having a difficult time getting a permanent liquor license from the DABC. They don't qualify for a restaurant liquor license, because the venue doesnÕt have an on-site kitchen. They were denied a reception center license because they need to serve more than just offerings from food trucks. A bar license is an option, but the CarletonÕs would prefer to keep The Garten an all-ages venue, so that parents can bring their minor children. Right now they are operating on special event permits. (Francisco Kjolseth | The Salt Lake Tribune) Ben Kuechenmeister enjoys a beer at The Garten on Friday, Sept. 7, 2018. Jeff and Jennifer Carleton, owners of The Garten, a new German-inspired beer garden in Salt Lake City are having a difficult time getting a permanent liquor license from the DABC. They don't qualify for a restaurant liquor license, because the venue doesnÕt have an on-site kitchen. They were denied a reception center license because they need to serve more than just offerings from food trucks. A bar license is an option, but the CarletonÕs would prefer to keep The Garten an all-ages venue, so that parents can bring their minor children. Right now they are operating on special event permits. 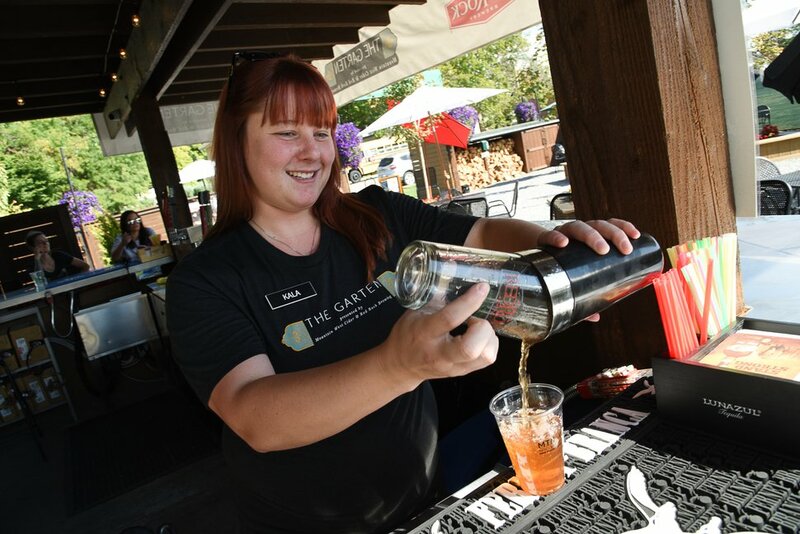 (The Salt Lake Tribune | Kathy Stephenson) The bar inside The Garten in Salt Lake City (Trent Nelson | The Salt Lake Tribune) The Garten, a new German-style outdoor beer/food venue in Salt Lake City, Sunday Sept. 2, 2018. (Trent Nelson | The Salt Lake Tribune) The Garten, a new German-style outdoor beer/food venue in Salt Lake City, Sunday Sept. 2, 2018. (Trent Nelson | The Salt Lake Tribune) The Garten, a new German-style outdoor beer/food venue in Salt Lake City, Sunday Sept. 2, 2018. The Garten, for example, doesn’t qualify for a restaurant liquor license, because it doesn’t have an on-site kitchen. In June, the Carletons applied for a reception center license with the DABC, but the state liquor commission wasn’t sure that having food trucks fit the “culinary facilities” requirement of the license. The commission turned to the Utah attorney general’s office for advice. An opinion, issued in July, essentially determined that The Garten “did not meet the statutory standards of possessing culinary facilities and, as such, cannot be granted a reception center license," said DABC spokesman Terry Wood. A bar license could be another option to pursue, but the Carletons are hesitant. They would prefer to keep The Garten an all-ages venue, so parents — such as Murray resident Janae Smith — could bring their minor children. The Garten’s predicament is an example of how complicated Utah’s liquor laws can be for businesses. (Francisco Kjolseth | The Salt Lake Tribune) Kala Rae pours a drink at The Garten recently. 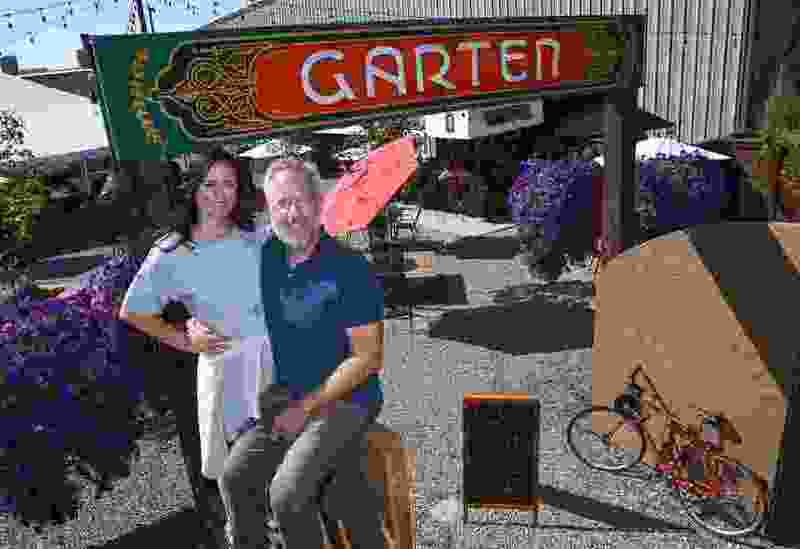 Jeff and Jennifer Carleton, owners of The Garten, a new German-inspired beer garden in Salt Lake City are having a difficult time getting a permanent liquor license from the DABC. They don't qualify for a restaurant liquor license, because the venue doesnÕt have an on-site kitchen. They were denied a reception center license because they need to serve more than just offerings from food trucks. A bar license is an option, but the CarletonÕs would prefer to keep The Garten an all-ages venue, so that parents can bring their minor children. Right now they are operating on special event permits. For now, the Carletons have found a temporary solution to their liquor license woes by getting special-event permits from the DABC. 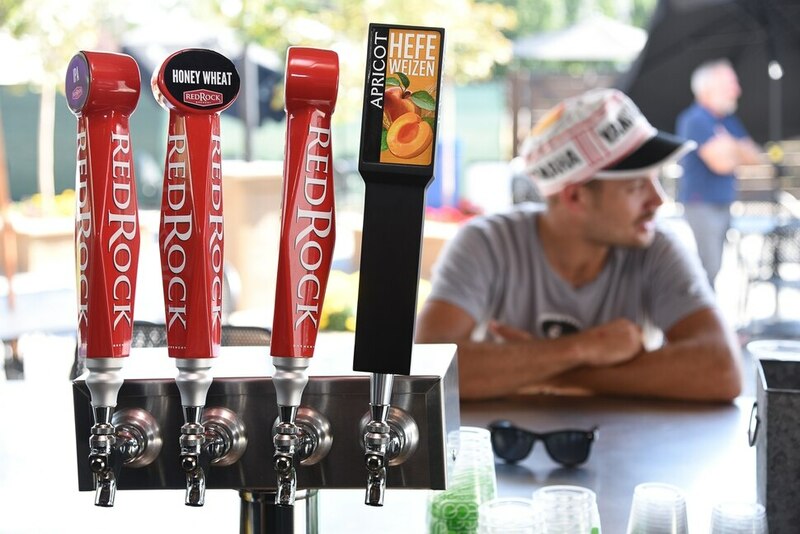 Each permit allows the venue to sell beer, wine and spirits for up to three days at a time. To fit the requirement, The Garten is open Friday and Saturday, 11 a.m. to 10 p.m., and Sunday, 11 a.m. to 5 p.m. Under state law, groups and businesses are allowed only 12 special-event permits a year, which limits the number of weekends The Garten can be open. This creates inconsistency, which can be confusing for customers, said Jeff Carleton, who spent 10 years stationed in Germany as an officer in the U.S. Army. He and Jennifer have spent at least $50,000 to purchase the empty lot next to their cider production facility and pay for the improvements. That’s a hefty investment to be open only 12 weekends a year, Carleton said. “It would be nice to have a longer season and for our customers to know when we are going to be open." 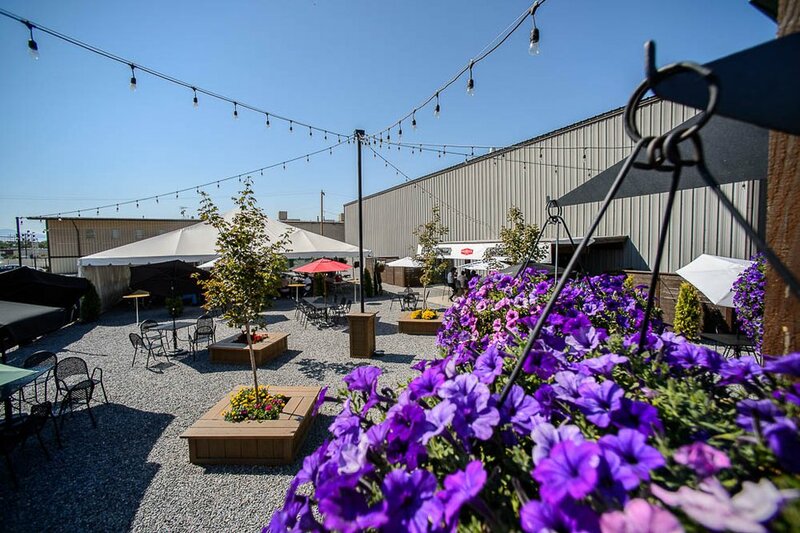 Several nonprofit and community groups have rented the venue for events, which will help to keep The Garten open into October, said Jennifer Carleton. This weekend, Sept. 7-9, Salt Lake City’s Rock ’n’ Roll Camp for Girls will hold BABEfest; next weekend, Sept. 14-16, the Harvest Bash, sponsored by the Green Urban Lunch Box, will take over the space; and Sept. 21-25, is the Marmalade Jam Fest. The licensing dilemma is not the first time the owners of Mountain West Hard Cider have had trouble with state alcohol laws. Since 2015, when Mountain West Cider opened, the state was taxing cider producers the same as winemakers, and it was crushing the company’s ability to expand. The Carletons spent more than a year — and hired a lobbyist — to help change the law and create a separate tax category for ciders, similar to what is done by the federal government, which makes it easier to grow their business. The Legislature approved the change earlier this year along with several other alcohol policy updates. 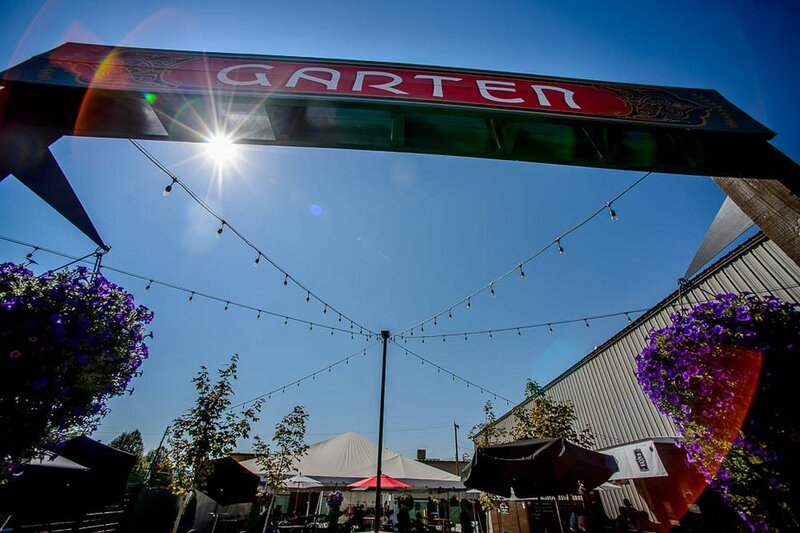 (Trent Nelson | The Salt Lake Tribune) The Garten, a new German-style outdoor beer/food venue in Salt Lake City, Sunday Sept. 2, 2018. The Carletons are contemplating a similar effort for The Garten. Customers like Salt Lake City resident Michel Segovia would welcome the effort because "this is going to be my new spot,” she said, as she sat at the bar with her friends and listened to Spot & Waldo perform country and rock favorites.